If you're shelling out serious money for a monitor controller, you expect perfection — is that what the M905 offers? The monitor controller is, in my view at least, the most quality-critical element of any studio system. My reasoning for such a bold statement is that this device is a permanent fixture in the monitoring chain — the window through which we 'look' at the sound we produce — and it is therefore critical to the evaluation of audio quality and, consequently, every recording and mixing decision that we make. A monitor controller cannot improve the source sound quality but it certainly can degrade the monitoring signal, and for that reason I would argue that the monitor controller is actually more important even than the monitor speakers themselves! A good monitor controller must have a scrupulously transparent and accurate signal path. It should also provide an adequate suite of tools with which to evaluate and examine the monitored signals. Most controllers feature a number of selectable inputs and a few different outputs, along with a volume control of some sort, but a good monitoring controller provides more than that. For starters, the volume control needs to have a marked reference position so we can work at a known, properly calibrated, listening level. The different outputs and inputs should have level trims as well, so that we can match loudness levels for different sources and destinations. Dim and cut functions to attenuate or mute the output are also basic practical requirements. sum is a vital function, as it allows you to check for phase problems, and being able to route that to a single speaker avoids the inflated bass perception inherent in a phantom-mono presentation between stereo speakers. Being able to mute (or solo) individual loudspeakers is also very useful in identifying some stereo problems. The option to flip the polarity of one channel is vital for checking phase issues, of course, and if that polarity flip occurs prior to the mono sum function we can use both together to audition the 'stereo difference' signal. This is a depressingly rare inclusion, but it's extremely useful for gain-matching stereo systems and mic arrays, as well as for assessing the damage inflicted by lossy data-reduction systems. Moving beyond these primary monitor controller facilities, some monitor controllers incorporate additional functionality to configure, control and audition artist cue mixes, which can be very useful in some applications. Talkback functionality then becomes relevant too, of course. Some controllers also provide additional outputs to dub signals between equipment, or to feed metering systems. The number of commercial monitor controllers that provide all those functions at an appropriate quality level can be counted on the fingers of two hands, and most are high-end, expensive products aimed primarily at mastering studios. 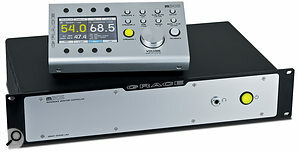 Not surprisingly, the Grace Design M905 Reference Monitor Controller fits easily within that description. It meets every one of the essential requirements I've cited above — and throws in many nice extras too. Grace describe their M905 as a 'second-generation' product, since it replaces the much-loved M904 reference stereo monitor controller — a widely adopted mastering-grade monitor controller that remained in production for nearly 10 years. The new M905's overall design, connectivity and functionality are all very similar to its antecedent, but internally this is a complete ground-up redesign. Grace claim incremental technical improvements in performance across the board through extensive reworking of the analogue, D-A converter and digital interface sections. This is most noticeable in the digital audio performance, thanks to the adoption of the same advanced D-A converter and asynchronous USB technology that was introduced in the company's M903 stereo controller (reviewed in SOS October 2012). Additionally, the M905 benefits from an enhanced feature set and an improved user interface. The previous-generation product was available either as a self-contained model, controlled directly from its front panel (M904), or as a remote-controlled version (M904b). The new M905 is only available in a remote-controlled format, fundamentally because the new large TFT display wouldn't fit onto a 2U-rack product's front panel. The M905 is a fully equipped and surprisingly versatile mastering-grade monitor controller, its design having evolved to reflect the changing priorities of modern installations. An intuitive menu system allows a great deal of configuration and customisation of various functions, with some additional options being made available through jumpers inside the rackmount hardware. Most functionality can be accessed via the small desktop remote control.The analogue monitoring sources comprise one stereo-balanced and one stereo-unbalanced input (reduced from the M904's two and one, respectively), plus the balanced analogue artist cue input. The digital input count is increased by one over the M904, with the same coaxial and optical S/PDIF, two AES3, and ADAT input combination, the last being selectable in stereo-channel pairs, and with S/MUX support for double sample rates. The AES3 inputs can be configured as a dual-wire connection, if required, and both the AES3 and S/PDIF inputs support the DoP 1.1 format, which accommodates both standard and dual-speed DSD one-bit signals. All selected digital sources pass through the on-board DAC to appear as an analogue source for the rest of the monitor controller, ensuring a consistent quality, and Grace Design's well-proven s-Lock jitter-rejection system minimises cable-induced jitter for external digital signals. The new extra digital input, of course, is the asynchronous Class-2 USB connection. This supports stereo PCM audio up to 24-bit/192kHz, as well as DoP 1.1 DSD audio. The 'asynchronous' tag means that the DAC clocks the data out of the computer when it wants it, rather than waiting for the computer to push it out when convenient, and that provides a marked step up in USB audio quality. 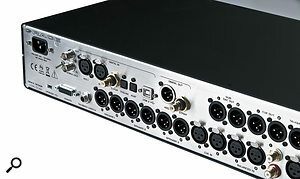 Additionally, the USB interface can pass up to 10 audio channels back to the computer, so the M905 can also serve as a high-quality two-down, 10-up computer interface. An alternative USB mode configures the USB operation as a simple two-in/two-out interface, with the inputs again being the last selected digital source. This mode requires less USB bandwidth, which may be advantageous in some cases. In either mode, the USB operation is completely driverless for Mac OS X platforms, but an ASIO driver is required for all the usual Windows platforms (downloadable from the Grace Design web site, though not, at the time of writing, for Windows 8). One small operational caveat is that the up and down USB channels must be running at the same sample rate, which means that possible sample-rate conflicts may limit the ability to monitor some external digital sources. Comprehensive digital and analogue I/O are catered for on the rear of the 19-inch rackmount unit.Analogue outputs are provided for three separate sets of loudspeakers (each with assignable subwoofer output options), plus a configurable stereo analogue output. The latter can be used to provide any assigned subwoofer outputs, an analogue meter feed, or the direct D-A output. Two headphone outputs are also provided, wired in parallel and presented on the remote controller and main rack unit. These can carry either the artist cue signal, or the monitor controller source signal (which may be selected as the artist cue input). Digital outputs are provided simultaneously in both AES3 and S/PDIF formats to feed other equipment, if required, derived either from a single pre-selected digital input or to follow the last selected digital source. The remote controller incorporates a talkback mic which can be switched (configurable as latching or momentary) into the artist cue output signal, simultaneously dimming the speaker outputs and, optionally, the cue source. The same internal mic is also used to derive a sound-pressure level of the monitoring environment, and display that value on the LCD panel as a handy guide to monitoring level (with customisable A and C weighting filters, peak-hold and ballistics settings). An external talkback mic can be used instead of, or as well as, the internal one. The high-quality internal mic amp has switchable phantom power and adjustable gain from +15 to +70 dB. The signal from either the internal or external talkback mic can also be dispatched as a line-level output for use elsewhere, and in this way it's also possible to use the external mic input as a single-channel high-quality standalone mic preamp, if desired. The M905 hardware unit occupies 2U of rack space. It extends some 225mm behind the rack ears, and weighs 3.54kg. The only front-panel facilities are a large, illuminated on/off button and a quarter-inch headphone jack socket. In contrast, its rear panel is festooned with all manner of socketry. On the analogue side of things, stereo pairs of male XLRs provide three speaker outputs, artist cue out and a configurable stereo subwoofer/DAC/meter output. A single male XLR provides the line-level talkback output. Inputs are accommodated with two pairs of female XLRs for the balanced monitor and artist cue inputs, with an additional XLR for the external talkback mic input. A pair of insulated RCA-phono sockets is provided for the unbalanced monitor inputs. The digital facilities are equally comprehensive, with two AES3 inputs (on XLRs), S/PDIF on RCA-phono and Toslink optical inputs, an ADAT optical input, and a USB 2 computer input (B-type socket — an A-to-B USB 2 cable is included). Digital outputs are provided in both AES3 and S/PDIF flavours, and word clock is provided in both directions via BNCs, the input with an associated toggle switch to select 75Ω termination. A 15-way D-sub socket connects the remote-control panel via a delightfully soft and flexible 7m (25ft) Mogami cable, and wiring details are provided for custom installations. A quarter-inch TRS socket allows footswitch activation of talkback, and a tally-light output is available on the same socket for a remote switch, if required. A second (mini) USB socket is provided for rack-processor firmware updates (v1.12 was installed on the review model). Mains power is connected through the usual IEC inlet, with an internal universal power supply accepting 100-240V AC, and consuming up to 60W. The remote-control panel is quite substantial, measuring 226 x 159 x 59 mm and weighing just under 1kg, and the display can be tilted up from its base plate to set an appropriate desktop viewing angle. Its rear panel carries another 15-pin D-Sub connector for the cable back to the main processor unit, a quarter-inch headphone socket (wired in parallel with that on the rack processor panel), and a second mini-USB socket for controller firmware updates (again, v1.12 in the review unit). Much of the operation of the M905 will be familiar and intuitive to users of other Grace monitor controllers — pressing the large aluminium volume knob to toggle between controlling the speaker or headphone volumes, for example. The colour LCD indicates the current volume settings for both outputs in large adjacent numerals, with the active output coloured green. The default display is scaled from zero to 100 and adjustable in half-decibel steps with the speed-conscious detented encoder knob. However, it's also possible to program via the setup menu a reference level for each speaker, and have the display count in decibels above and below that reference point, if preferred. The actual monitoring SPL, as detected by the built-in talkback mic, is also permanently displayed below the speaker volume setting, while the digital input source parameters are revealed below the headphone volume setting (word-length, sample rate, clock source, and s-Lock status). The frequency response measured from an analogue input to the speaker output, on a greatly expanded scale, demonstrating a response within -0.1dB from 20Hz to well over 80kHz.Eight small and two larger illuminated buttons control the main monitoring functions. The primary speaker output selector has a large button, while the other two have smaller buttons. Two more small buttons mute the speakers and subwoofers, and two more provide the Dim and Mono functions. The second large button activates talkback, and the last two small buttons route the monitor source to the artist cue output and access the Setup menu modes. Five of the small buttons feature secondary functions, which are activated by holding the button down. The mono button doubles up with the stereo-difference mode, the Dim button activates Grace Design's cross-feed circuit (for a more speaker-like headphone listening experience), the mute buttons turn into individual speaker solos, and the Mon>Cue button clears the stored peak-SPL reading. Rest assured that it's all far easier and instinctive to use in practice than it might seem from this description! Upon entering the menu mode (which is never more than two levels deep), the main system menus are accessed via the mono button, with repeated presses scrolling around the firmware numbers and default reset mode, SPL meter setup (weightings, peak hold and ballistics), display setup (display back light and auto-dim timer), and digital output configuration (digital outputs follow the selected digital source, loop-through a specific digital input, or are off). The various functional submenus are accessed via the relevant function buttons; for example, the loudspeaker selectors to set the individual speaker output options, the Dim button for the Dim modes, the Mon>Cue button for the cue output configuration, the Sub button for the Sub/DAC/meter output modes, and the input selectors for the individual input setup options. Again, it's actually all very logical and simple. Looking at these various menu options in a little more depth, each of the three speaker outputs can be individually named, their output levels trimmed (over a ±20dB range in 0.5dB steps), and their balance adjusted (±10dB in 0.5dB increments). If required, two separate assignable mono subwoofers, or a single stereo subwoofer pair, can also be derived and their offset levels adjusted, too. The dim level can be set anywhere between -5 and -35 dB (the default is -20dB). Above and below the display window are two rows of four black buttons. These select the monitoring sources indicated in the corresponding text boxes across the top and bottom of the screen. In the case of the AES3 and ADAT inputs, repeated presses of the corresponding button cycles through the alternative sources (ADAT 1-2, 3-4, 5-6, 7-8, and AES 1/2). Through the menu system, the individual source labels can be renamed to suit the installation, if required, and any required level offset (to match loudness level) dialled in over a range of ±20dB in 0.5dB increments. 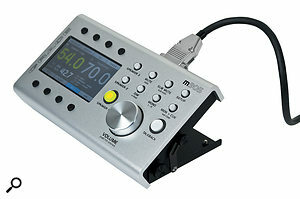 The clock source employed with each digital input can also be selected (external word clock or source-embedded), s-Lock jitter-busting function disabled, de-emphasis filtering enabled, disabled or left to the default automatic mode, and S/MUX enabled for the ADAT inputs (supporting up to four channels at 96kHz). Trimming a source level on the fly to match auditioning loudness requires just four button pushes and a twirl of the rotary encoder — and it can be done faster than it takes to read this sentence! I mentioned the configurable sub/DAC/meter analogue outputs earlier, and their operating mode is established via a menu accessed from the Sub Mute button. When selected as a subwoofer output, the outputs are determined by the speaker setup options and, conversely, the speaker subwoofer outputs won't function unless the Sub mode is activated for these physical outputs. In the DAC mode the outputs provide a dedicated D-A output with a configurable output level and balance, for use in digital-to-analogue transfers, for example. The Meter mode provides a metering signal that follows the monitor source selection and mode switching, and it can be configured to operate at any desired fixed level, or to follow the speaker level control. More menu options allow the cue-source output level (-100 to +20 dB) and balance (±10dB) to be adjusted, as well as the level of dim attenuation applied to the cue source when talkback is activated (0 to -35 dB). The output level (0, +10 and +20 dB) and L/R balance (±10dB) of the headphone outputs can also be tweaked, as well as a preset volume level established. Simultaneous or exclusive output modes are also available, the latter meaning that toggling to the headphones mutes the speakers and vice versa. The former allows both the headphones and speaker outputs to be active simultaneously. The headphone output can also be isolated from mono selection, so it always works in stereo, and the source can be configured via jumpers to always follow the monitoring source, or to pass just the cue signal unless the Mon>Cue button is pressed on the remote-control unit. The Grace Design M905 exudes an air of build quality and professional competence that is matched by few other manufacturers, while the sound quality is sublime — both technically and sonically. The AES17 dynamic range performance of the internal DAC delivered an impressive 119.7dBA, exceeding the Focusrite Forte and UAD Apollo interfaces (both of which score 118dBA) and approaching the Lynx Hilo's impressive 120.5dBA and Antelope Eclipse 384's 121dBA. 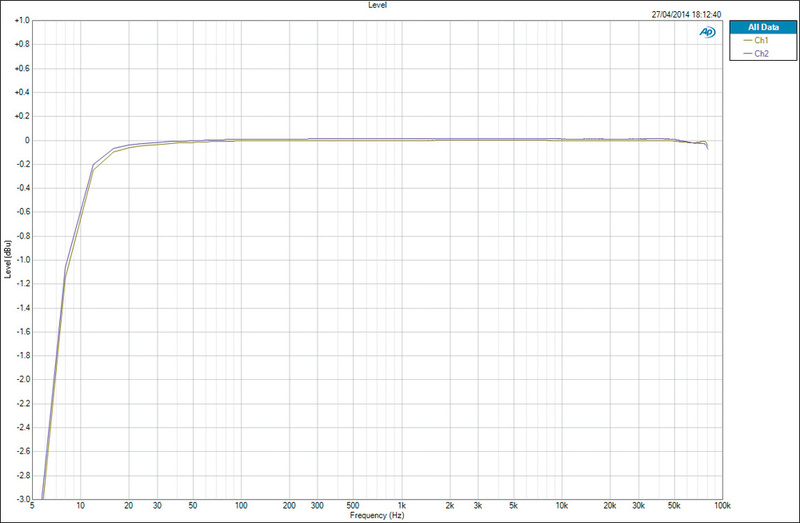 For reference, the current standard-bearer in my bench tests is the Benchmark DAC2 HGC, at an outstanding 125dBA. All of my Audio Precision (AP) bench tests delivered results that were within a fraction of the published specifications for the M905. For example, crosstalk between analogue speaker outputs measured -108dB at 10kHz, output noise was below -104dB, SNR ratio was 113dB, THD+N was comfortably below 0.001 percent for both analogue and digital sources, and the frequency response was flat from 6Hz (-3dB) to way beyond the A graph showing the contributions of harmonic distortion components for an analogue source. 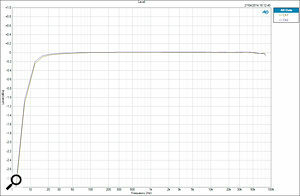 The third harmonic is slightly dominant, but remains around -120dB below the input. 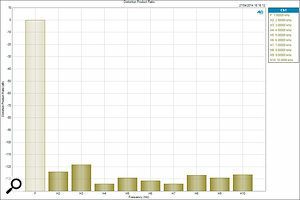 measuring capability of the AP system. 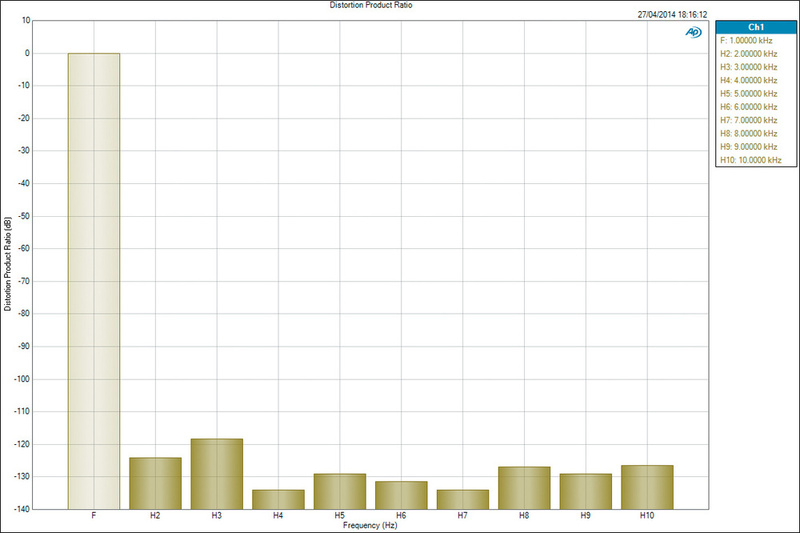 Grace Design claim -3dB at 1.25MHz and I don't doubt it! Listening tests proved fruitless as I couldn't hear the presence of the M905 in any of my reference monitoring systems at all — which is at it should be, of course. I tried to find something I didn't like about the M905 — such is the role of a critical reviewer — but failed completely. This is a simply stunning product, with almost every monitor controller function I could wish for provided, either directly or as an easily configurable option. The operation is obvious, straightforward and convenient; the display elegant and informative; the control panel simple with clear status indications; and the interconnectivity versatile and comprehensive. There were a couple of functions that I'd like to see added if possible. First, I'd like the ability to configure via the menu system the mono sum function so that it sends the summed signal to only one loudspeaker. It would also be nice if the polarity of one (or both) channel(s) could be inverted to check the source phasing — this could be achieved as a secondary press-and-hold function of the Setup button, perhaps. It would also be nice if the currently selected input source's offset level was indicated somewhere, perhaps as part of the data-parameter box under the headphone level readout. It would also be very cool indeed if the current SPL measurement display could be configured to provide the LAeq noise exposure to which the operator is being subjected over the working day, instead. Hopefully, all of these things should be easily incorporated via firmware upgrades, as the underlying technology is probably already in place. All I'm really left with to complain about, then, is the price, but even that seems a churlish act given all that's on offer here. In comparison with my regular monitoring controllers, the M905 sounded cleaner than my ageing Grace Design M902, and I couldn't tell it apart from my Crookwood M1 mastering console with either analogue or digital sources. The M905 sounds totally transparent, which is all that can be asked of such a device. It's a simply fabulous product that does all that is expected of it, perfectly. In fact, this mastering-quality monitoring controller ticks all of my boxes and is beyond reproach. At this price and performance level, the only realistic peers are Crookwood's monitor controllers, the CraneSong Avocet and Dangerous Music's Monitor. If you can bear its 'form over function' approach, the Shadow Hills Oculus might be deemed a contender, too. Flexible configurability and comprehensive I/O. Class 2-compliant USB interface with two-down and 10-up capability, and ASIO windows drivers. Artist cue facilities and a built-in talkback mic that provides continuous evaluation of SPL. Mono sum cannot be routed to a single speaker. No single channel or absolute polarity inversion options. A very versatile and configurable stereo monitor controller with artist cue and talkback facilities, comprehensive monitoring tools, an elegant user interface, and mastering-grade performance. Grace Design +1 303 823 8100.